Oil prices have plummeted over the course of 2015 and on into 2016. The low-cost of gas at the pump means the average joe feels pretty good about their relationship to the economy, but behind the scenes, huge sell-offs are taking place. One question I have is: who is buying up the now dirt cheap energy companies? Clearly there is a redistribution of wealth happening. In today's world, companies are overleveraged by design, meaning that most of their operating capital comes in the form of short-term loans from big banks. If business goes poorly, then paying back the loan is impossible. Unless sufficient surpluses are available, the company will go bankrupt. This is exactly what happened to over 67 US oil and natural gas companies in 2015, and there are already dozens more waiting to file, according to the below article. 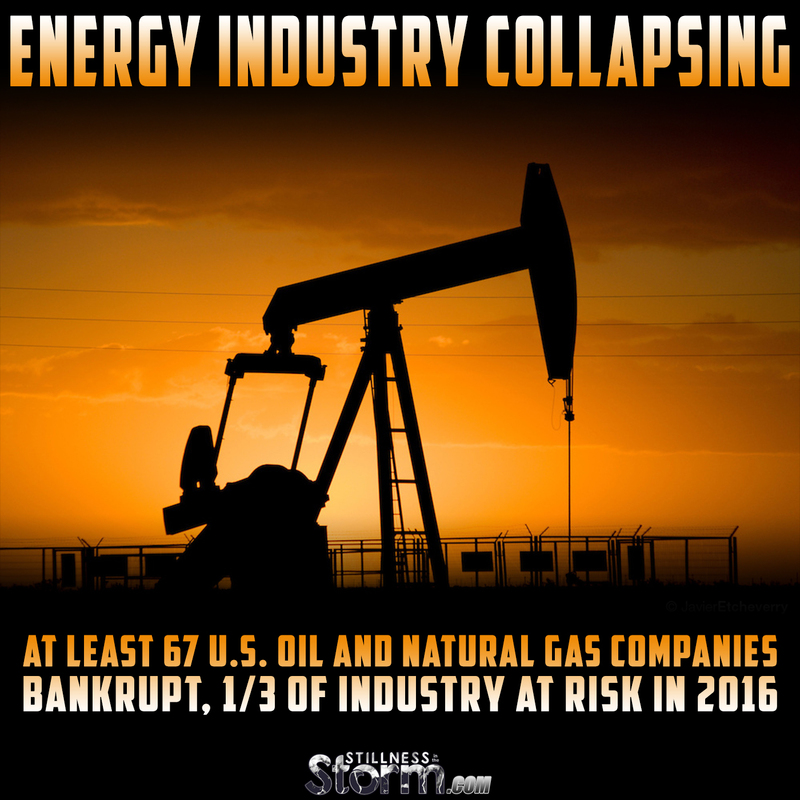 In addition, the forecast for this year is equally disquieting, and according to a second Zero Hedge article, a third of the energy industry is at risk of default in 2016. The recent loss of Deutsche Bank stock seems to be tied to the overvaluation of energy commodities. And there are other impacts on the economy at large, such as surging gold prices, as investors seek for 'safe' places to put their money. For those seeking a world free of market manipulation and financial servitude, the outlook may be good. The current state of affairs on this world is that of debt-slavery and artificial scarcity, maintained by deceptive acts and practices employed in secret against all the people of Earth. Times of economic turmoil are when the average person feels the burn the most; the best time to offer wisdom to awaken our fellows to the truth about money and how we can restore this world back to peace and prosperity. The hidden controllers rely on the masses being ignorant of how financial systems work, this way we accept what happens as if it is some form of man-made weather. 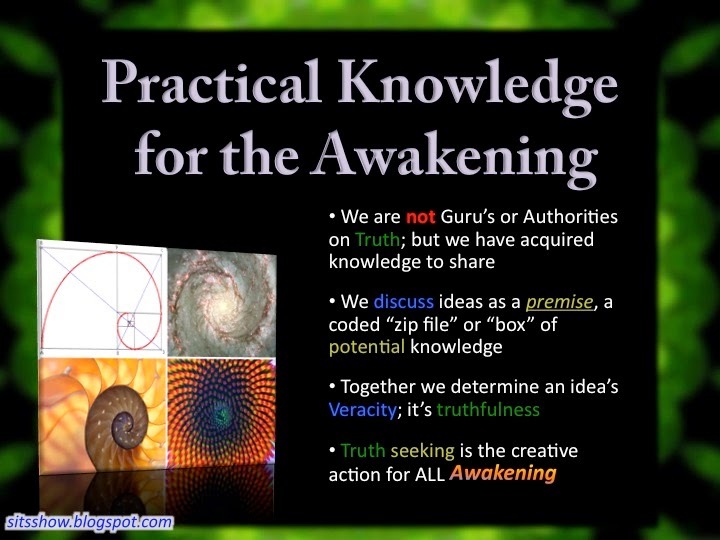 Therefore, seeking knowledge and sharing it with others is the only way to lay the foundations for a truly honorable and abundant system of commerce. 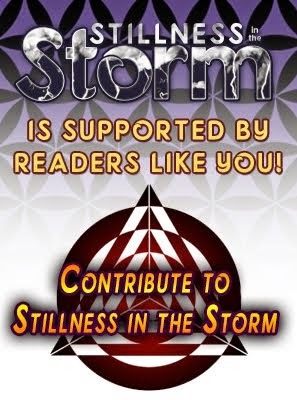 One where each individual knows their own power to generate abundance and ensure safeguards are in place to protect future generations against the machinations of would-be controlers. "It looks pretty bad. We fully anticipate it's only going to get worse," said Buddy Clark, a partner at Haynes and Boone and 33-year veteran in the energy finance space. This bleak outlook highlights one of the flip sides to cheap energy prices. Sure, it's great for drivers filling their tanks with cheap gas. But it's also fueling the demise of dozens of drilling and servicing companies -- and killing thousands of jobs in the process. Even Chesapeake Energy (CHK), one of the better known winners from the shale boom, was forced to deny bankruptcy rumors earlier this week as its stock tanked. The dramatic increase in bankruptcy filings corresponds with the plunge in oil prices from over $100 a barrel in mid-2014 to below $27 today. It also reflects the drop in natural gas prices, which are near 14-year lows. When oil prices were comfortably in the $90-$100 range and the shale oil boom took off, companies took on tons of debt to fund expensive drilling. But the ensuing surge in U.S. oil production created an epic supply glut that caused crude to crash. Revenues have dropped, choking off cash flows and making it challenging for companies to pay off all that debt. Companies have responded by cutting jobs and slashing spending. But some of the more leveraged ones have been forced to resort to bankruptcy. For instance, last March Fort Worth-based Quicksilver Resources collapsed under the weight of more than $2 billion in debt taken on to finance its drilling in the Barnett Shale in Texas. Quicksilver's assets were put up for sale. However, in a sign of how messy these restructurings can be, it took 10 months for Quicksilver's oil and natural gas acreage to be auctioned off. Quicksilver's assets fetched just $245 million, or one-fifth of the company's estimate of its assets at the time of the filing. Clark said bankruptcies and auctions get slowed by complex capital structures that pit investors with competing interests against one another. "To get all those constituencies aligned is like herding cats -- cats who don't like each other," he said. Besides Quicksilver, a number of other oil and natural gas companies with at least $1 billion in debt have filed for bankruptcy, including Sabine Oil & Gas, Milagro Oil & Gas, Samson Resources and Swift Energy. 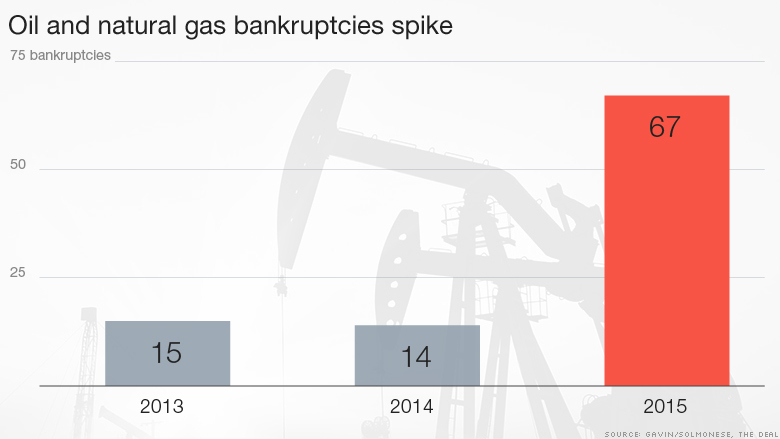 Just in the past week, at least three smaller oil and natural gas companies filed for bankruptcy in Texas and Oklahoma, according to Haynes and Boone. It's very likely a lot more energy companies will succumb to the commodities crash, especially oil services firms. These companies have less bargaining power with banks because they don't actually own the oil in the ground, they just help extract it. Clark said he knows of at least another half-dozen bankruptcy filings being prepared for the next few weeks alone -- including some larger and publicly-traded oil and natural gas companies. "We saw the low hanging fruit already happen. Now the ones that were able to survive this long are going to start teetering," said Ted Gavin, founding partner of Gavin/Solmonese, which did the bankruptcy analysis from data compiled by The Deal. Even the oil drillers that survive face an uncertain future. "The companies that are just making it today may not have the cash to invest in their future. That's a recipe for disaster three or four years from now," said Gavin. At 1600bps, the extra yield investors are demanding to take on US energy credit risk has never been higher. 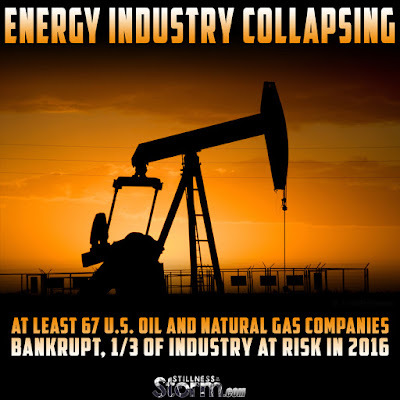 However, if a new report from Deloitte proves true, this is far from enough as they forecast roughly a third of oil producers are at high risk of slipping into bankruptcy this year as low commodity prices crimp their access to cash and ability to cut debt. The report, as Reuters reports, based on a review of more than 500 publicly traded oil and natural gas exploration and production companies across the globe, highlights the deep unease permeating the energy sector as crude prices sit near their lowest levels in more than a decade, eroding margins, forcing budget cuts and thousands of layoffs. "Service providers tend to be more of a people business with less capital deployed, so it's easier for them to financially flex," Snyder said. "Eventually, though, they've got to run out of gas, too."